ETran allows you to accept all payment types including checks and money orders, electronic payments (ACH), and credit and debit cards. 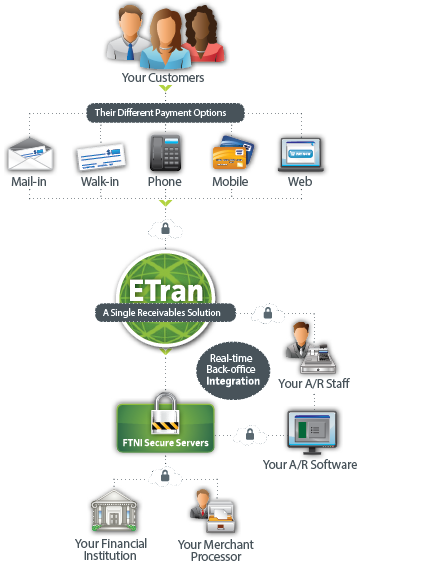 Whether payments are walked-in, mailed-in, phoned-in, paid via the web or from a mobile device, ETran’s single-platform, integrated receivables solution streamlines the entire remittance process. Accept checks (via mobile RDC), ACH, credit and debit card payments securely, from a stand-alone app, or by integrating a payment component into your existing mobile application. Facilitates the processing of single and recurring ACH and credit/debit card payments over the Internet via an integrated API or fully-hosted payments web portal. Full electronic invoice presentment and payment (EIPP) capabilities through a user-friendly front end, or intuitive web or mobile user interface that can be seamlessly integrated with your existing website, mobile application and payments environment. Choose between full (original) or simulated invoice presentment. Allows payment coupons to be associated with checks to streamline the payment posting process. Supports credit and debit card authorizations, as either card present or card not present transactions. Enables recurring ACH and credit card with either fixed or variable payment amounts. View Our Full Library of Videos, eBooks, Success Stories and Data Sheets to Learn More.